Anyway, we ordered the appetizer to start our evening in anticipation that this dip would be an improvement upon a childhood favorite. The menu said that the dip would be rich, creamy, and loaded with caramelized onions. Unfortunately, it was none of the above. Not nearly enough onions and they were nowhere near caramelized. 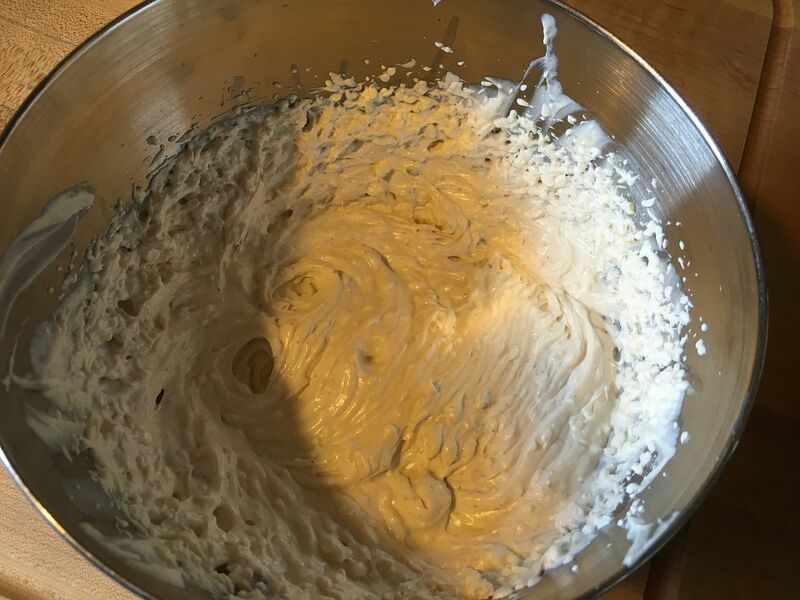 The base was rather bland, consisting of salted sour cream and lacking in other seasonings. So, I decided, I can make this and I can make it better. Off to the R&D labs we go. 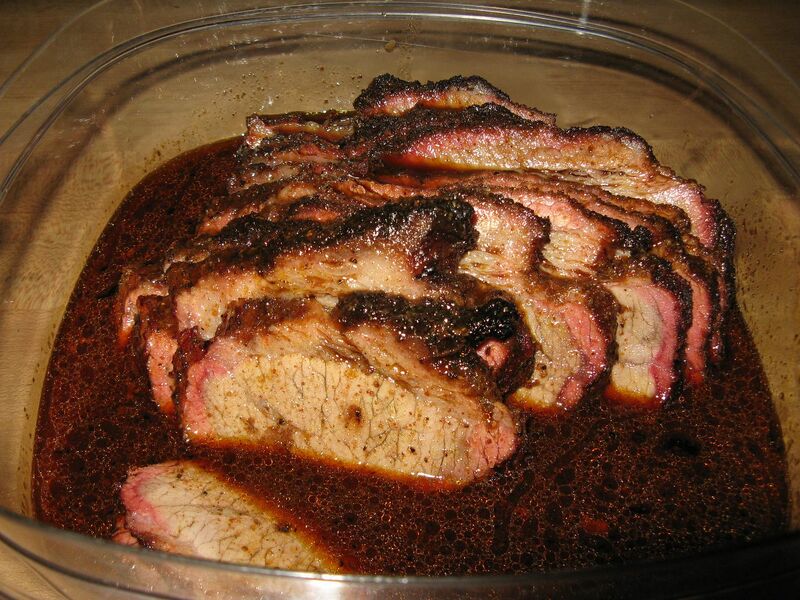 First, I lit my smoker and brought to 250 F with a medium sized piece of hickory in the ash pan for flavor. 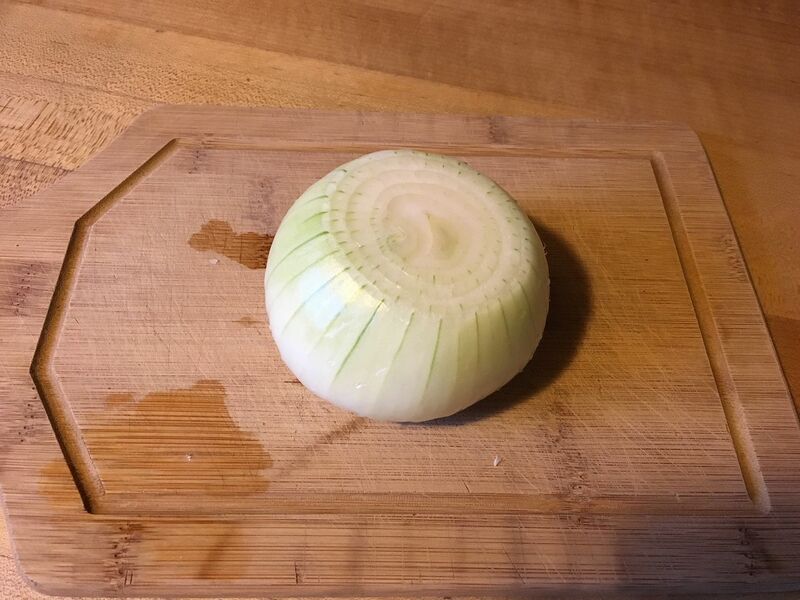 While the smoker was coming to temperature, I peeled, sliced, and diced my onion. 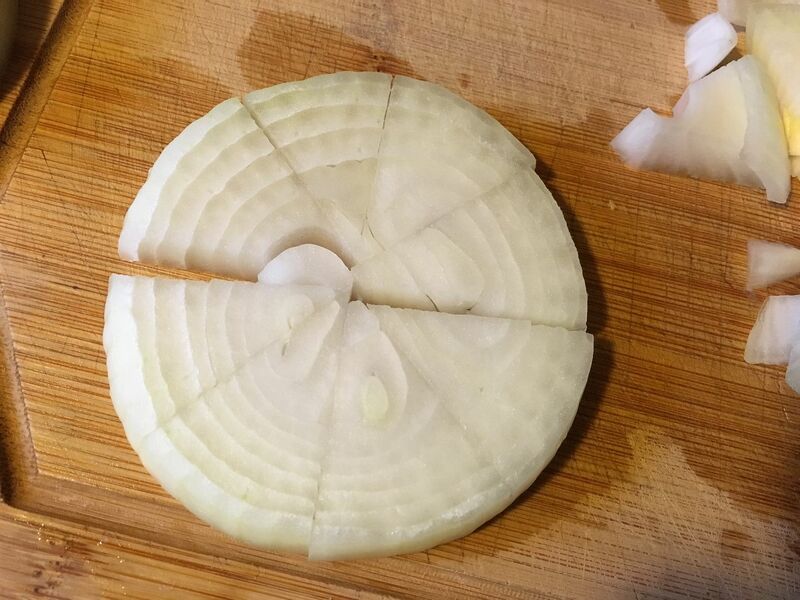 To dice my slices, I cut each slice into wedges like a pizza. This way the smaller pieces would be completely caramelized and the larger pieces would be caramelized and add some crunch to the final product. I mixed the onion with one tablespoon of olive oil and a healthy grinding of pink salt and ground pepper. 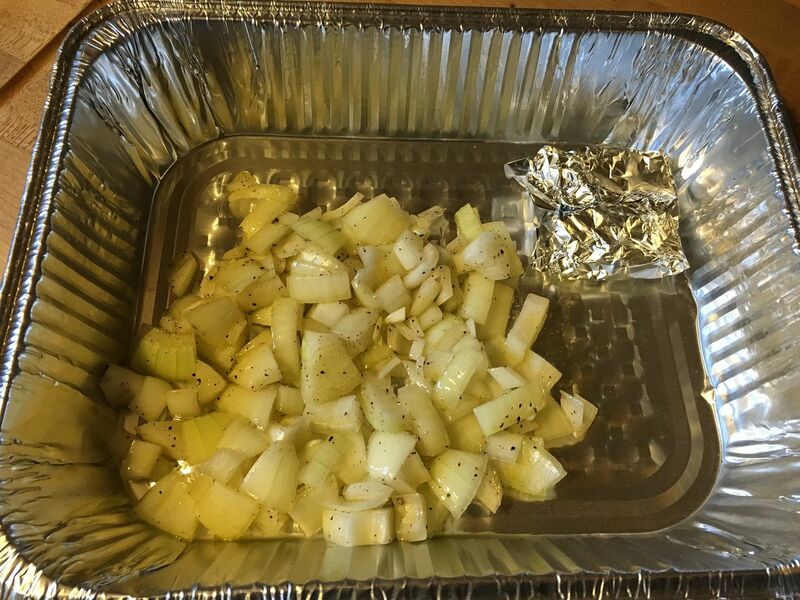 I also placed my garlic into a foil packet with a drizzle of olive oil and sealed the foil for roasting. All of this was placed into a foil pan and then into the smoker. After thirty minutes I went out and gave the onions a stir to promote even caramelization. After one hour I checked the onions and decided they needed 30 more minutes. 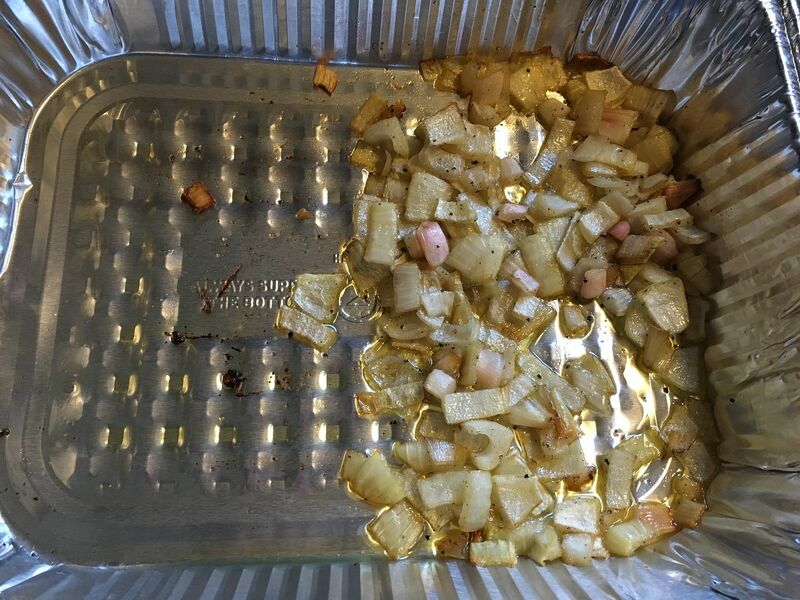 So, I tired them and removed the garlic as it felt soft in the foil packet. While the onions were smoking for their last 30 minutes, I removed the garlic cloves from their skins and placed in a large mixing bowl with all of the other ingredients. 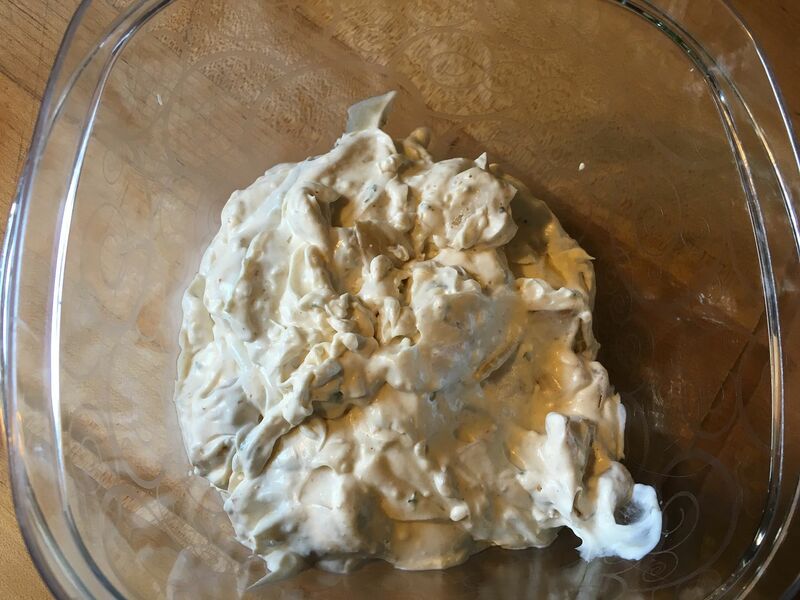 I blended thoroughly with my trusty hand mixer until the mixture was smooth and the roasted garlic was distributed evenly. 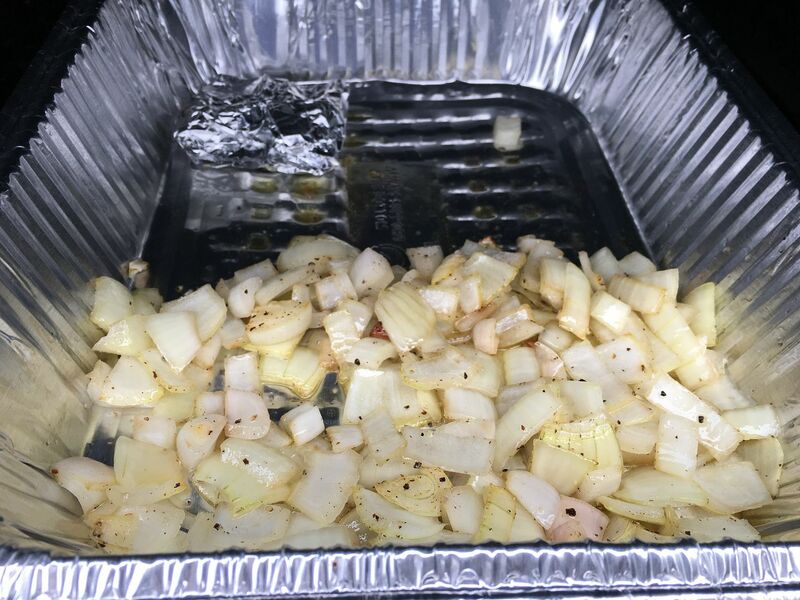 When the onions were done, 1.5 hours at 250 F total time in the smoker, I brought them inside and folded them into the dip. Then, I grabbed a chip to taste. Did I succeed? Oh yeah. Better than what Mom made or the dairy aisle tubs of mass produced dip. Great flavor and lots of caramelized and slightly crunchy onions. New Years is around the corner. 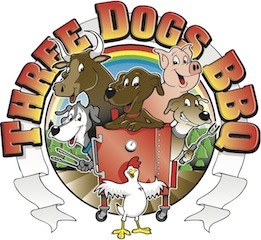 If you want to try this out and don't have a smoker, no problem. 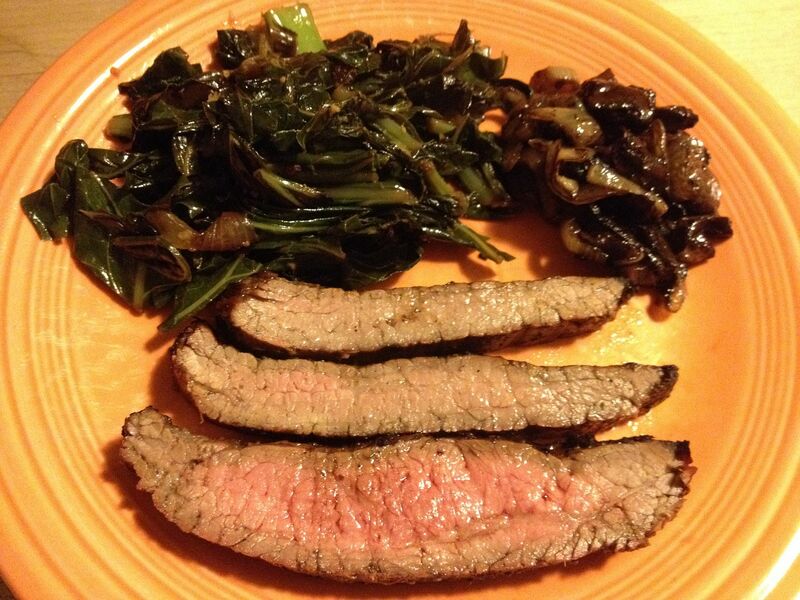 Just caramelize your onion in a skillet at low heat. Mix it up, put out some chips, and stand back.